You need software for 3 reasons (plus a whole lot more – but that is another blog post). #1 – Basic editing, including sizing a design, mirror-imaging, changing colors, etc. #2 – Printing paper templates to use as guides for embroidery placement. # 3 – Transferring a design from the computer or CD to the embroidery machine in the proper format. 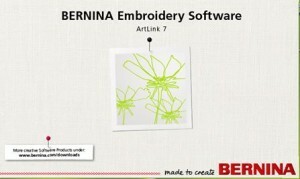 You can do all of these with the free (yes, I said FREE) Artlink Embroidery Software by BERNINA. 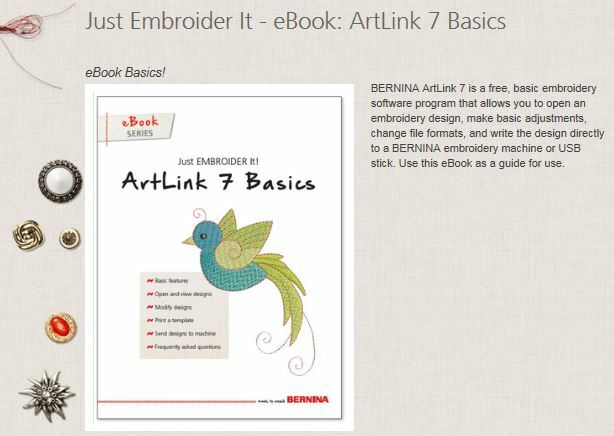 Click on the link HERE, or go to BERNINA.com and type ArtLink 7 in the search box. 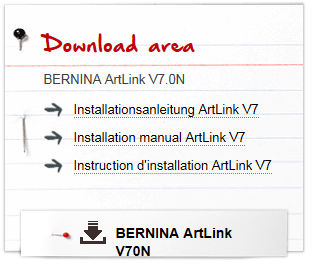 Click on the Installation Manual ArtLink V7 for instructions on how to download the files. Next click the BERNINA ArtLink V7ON tab to download the program to your computer. 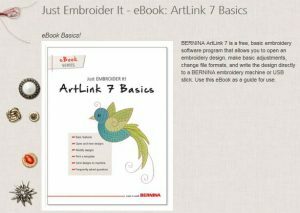 ArtLink 7 is an easy program to use, but for instructions download the ArtLink Basics eBook. This publication provides specific steps for editing designs, printing templates, and sending designs to the embroidery machine. Thanks for the ebook guide, I could’t figure that software out for the life of me! When will you have software for Mac users?